There are many reasons to visit the islands of a thousand treasures. To splash in warm, iridescent waters along pristine island shores. To dive ancient shipwrecks and virgin coral reefs. To sway to a soca beat, sipping local rum around a bonfire on the beach. But the most important reason is that you’ll share a smile with every new experience that unfolds on St. Kitts and Nevis. 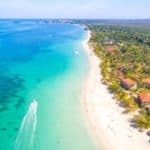 Both islands have mountain rain forests, uncrowded beaches, historic ruins, towering volcanoes, charming Georgian capitals, and restored 18th-century sugar plantation inns run by elegant and eccentric owners. These lesser-known but luxurious islands in the Caribbean are breathtaking. St. Kitts and Nevis is a place for travelers looking for resort relaxation and picturesque landscapes with a touch of adventure and a dash of history. St. Kitts is the more outgoing island, with the widest selection of restaurants, bars and hotels. Quiet and lush Nevis has the seclusion that some want, Nevis doesn’t have a single streetlight! Near-perfect packages – that’s how you you’ll think of St Kitts and Nevis. The two-island nation combines beaches with gorgeous mountains, activities to engage your body and rich history to engage your mind. The local culture is mellow, friendly and infused with a pulsing calypso beat. To learn more about all the beautiful beaches on the islands of St Kitts and Nevis, visit here. 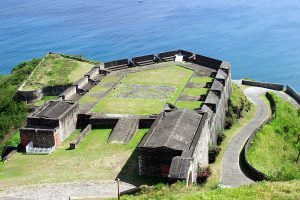 Now view our St Kitts and Nevis Travel guide to help plan your next Antigua and Barbuda vacation! Temperatures on both islands are tropical and moderate year-round. The average air temperature on the islands is between 78 to 88 °F throughout the year, and humidity is usually around 71%. The extreme high temperature is approximately 95 °F, and the extreme low can dip to 65 °F. The islands experience low humidity and are cooled by the northeast trade winds, making the higher temperatures bearable. The wet season is May through October, and is also the hottest time of year. Average temperatures during these months range from 78 to 88 °F, with an average rainfall of 4.52 inches. Hurricane season also occurs during these months, running from June to November. St. Kitts and Nevis location in the hurricane belt, means rain and high winds during hurricane season. During the winter months is the islands most popular seasons for travel. December to February are generally the busiest times to vacation on St. Kitts Nevis, though the high season of tourism extends into April. Because tourism is at its peak during these months, hotel rates are higher than other times of the year, and they are harder to book. If you plan to travel during this time, make reservations well in advance. Also, know that the usually quiet beaches may be more crowded, shops will be fuller, and island tours will be packed. 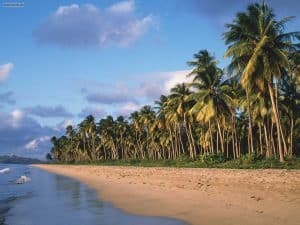 Some argue that the best time to vacation on St. Kitts or Nevis is during the summer months, which is their low season. From June to August, the beaches are usually less crowded and hotels and shops have more reasonable prices. Weather isn’t as pleasant during this time of year, but it is still paradise. This time of year is a recovery period for the island. Many businesses use this time of year to make renovations, so you could wind up staying in a hotel that is half shut down due to reconstruction. Shops and restaurants often close earlier during this season as well. You’ll need a passport (by air) that’s valid for six or more months past your visit, or passport card (by sea), to enter and exit St. Kitts and Nevis. Customs officials might also ask you to provide proof of sufficient funds, as well as proof of a return or onward trip. Visits to St. Kitts and Nevis may not exceed three months without a visa. For more information on entry and exit requirements, please visit the U.S. State Department’s website . Many travelers connect in Antigua, San Juan, St. Maarten, or St. Thomas. To Nevis, it’s almost always cheaper to fly into St. Kitts and then take a regularly scheduled ferry, but check the schedules or book a transfer from your resort (if available) in advance. There are nonstop flights to St. Kitts from Atlanta (Delta), as well as Charlotte, Miami, and New York–JFK (American). There are no non stops from the United States to Nevis. The widely accessible taxis are the easiest way to get around, and the drivers can conveniently double as tour guides by hourly rates. The government regulates fares, but make sure you agree on a price before you get in the taxi. The fixed rates will run you about $12 to $26, but rides after 10 p.m. come with an additional fee. Rental cars are also available on both islands, but not from the airports (though many companies offer a pickup service). You must obtain a temporary permit to rent a vehicle (bring your driver’s license), available on St. Kitts at the Traffic Department in Basseterre for about $25. And the rental fees will cost you between $45 to $70 a day, not including collision damage, surcharges, and deductibles. 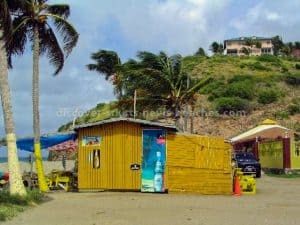 If you’re planning on island-hopping, some of the rental car agencies offer a rental exchange between St. Kitts and Nevis but only if you rent for the minimum of three days. Remember that driving is on the left side of the road. There are no public buses on the islands, only privately owned minibuses, some with interesting, party bus-like paint jobs. While the minibuses are an inexpensive way to get around, they don’t always stop at the popular tourist sites. If you’re in a rush, take a taxi. The island’s showpiece has soft golden sand on the calm Caribbean, lined with a magnificent grove of palm trees. The Four Seasons Resort is here, as are the plantation inns’ beach clubs and casual beach bars such as Sunshine’s, Chevy’s, and the Lime. Beach chairs are gratis when you purchase a drink or lunch. This beach is great for swimming or beach walking. Sundays are busiest. Even if you’re not a fan of military anything, this massive hilltop compound with its citadels, bastions, barracks and ramparts will likely leave a lasting impression. The British began construction of what was then a state-of-the-art fortress in 1690 and, using slave labor, kept refining it for about a century. In 1999 it became a Unesco World Heritage site. Wander up to polygonal Fort George to stand on the gun deck and take in the amazing views. It’s easy to spend a couple of hours wandering around this enchanting symphony of orchids, palms, water-lily ponds, bamboo groves and other global flora interspersed with sculpture, pools, ponds and fountains. In the Rainforest Conservatory parrots patrol the huge tropical plants, waterfalls and Mayan-style sculpture. A Thai restaurant serves lunch and refreshments. The ruins of this somewhat restored house and surrounding replicas of chattel-house cottages are set in 6 acres of glorious gardens, with exotic flowers, an old bell tower, and an enormous, gnarled 350-year-old saman tree. Inside, at Caribelle Batik, you can watch artisans hand-printing fabrics by the 2,500-year-old Indonesian wax-and-dye process known as batik. 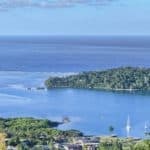 You can also stroll to the 17th-century ruins of Wingfield Manor, site of the first land grant in the British West Indies, and home to a zip-lining outfit. 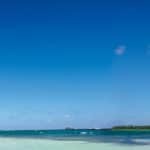 South of Mosquito Bay and north of Cades and Jones Bays, this beige-sand beach lined with palms and sea grapes is where the folks at Oualie Beach Hotel can mix you a drink and fix you up with water-sports equipment. There’s excellent snorkeling amid calm water and fantastic sunset views with St. Kitts silhouetted in the background. Several beach chairs and hammocks the sand and the grassy “lawn” behind it. This beach is great for snorkeling and beautiful sunsets. Experience the best of St Kitts & Nevis on a thrilling tropical adventure aboard one of their luxury Catamarans. 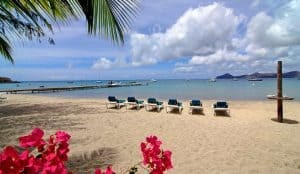 Different tours offer a wealth of island experiences, from snorkeling in a sheltered cove, relaxing beach time in Nevis , or a gourmet dinner at a beachside restaurant. For more information call 869-466-4933, or visit them on the web at Blue Water Safaris. The #1 Water Sports Center in the Caribbean. They do it all. Fly boarding, kiteboarding, Jet Ski rentals, Jet Ski snorkel adventures, paddle boarding, Sailing, wakeboarding, water skiing, kayaks and More! 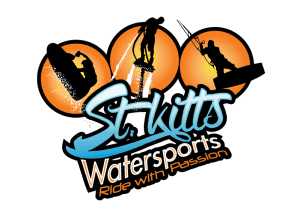 For more information call 869-762-3543, or visit them on the web at St Kitts Water Sports. Feel the natural power of the wind as it lifts you and you glide across the water. Certified IKO Instruction will ensure you have fun in safe and controlled environment! 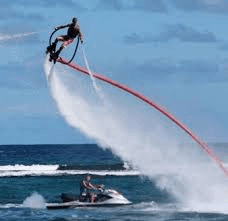 Fly boarding – Fly like Ironman with water jets shooting out of your feet. Rocket into the air, dolphin dive, backflip… So much fun and anyone can do it! For more information call 869-765-4246, or visit them on the web at Beach Addiction St Kitts Nevis. Pro Divers St Kitts is the island’s premiere PADI Scuba Diving facility. They offer a personal service and a fun atmosphere which enables you to get the most from your St Kitts scuba diving experience. For more information call 869-660-3483 or visit them on the web at Pro Divers. Explore the natural beauty of St. Kitts while riding your own ATV through mountains and valleys in Old Road. Your guides will take you on a breathtaking journey through cane fields where you will be enthralled by a vast species of trees and foliage that have been around for generations. For more information call 869-663-0623, or visit them on the web at Spectrum ATV Tours. The pool area of Horizons Villa Resort is transformed into a stylish eatery thanks to smashing ocean views, potted plants, serenading tree frogs, and elegant candlelit tables. Jamaican chef Verral Marshall fuses ultra fresh local ingredients with global influences. For more information call 869-466-8245, or visit them on the web at Marshall’s. Casual lunches take full advantage of the beachfront setting, with white tents and beach beds. But nighttime is truly spectacular, with outdoor fiber-optic fountains, a sleek interior with an eat-in wine cellar and tile-and-layered-wood sushi bar. Starters include the original maki rolls. Seafood such as breaded grouper in orange beurre blanc is masterfully executed; nothing at Carambola is overcooked. For more information call 869-465-9090, or visit them on the web at Carambola Beach Club. The ambitious menu of starters and main courses reflects co-owner-chef Alexander James’s peripatetic postings, includes crispy fried Brie, spring rolls with plum dipping sauce, mahi mahi with a cheese-and-basil crust, or teriyaki-glazed tiger shrimp. The wine list is well considered; vegetarians will be delighted by the many creative options; and very affordable lunches feature gargantuan tapas-style selections. For more information call 869-465-9999, or visit them on the web at Serendipity. This simple cluster of picnic tables sits on a sliver of sand. It is an island hot spot. There’s nothing fancy on the menu: just grilled fish, lobster, ribs, and chicken served with mountains of coleslaw and peas and rice. But the fish is amazingly fresh: the fishermen–owners heap their catches on a center table from which you choose your own dinner, then watch it grilled to your specification before dining family-style on paper plates. For more information call 869-466-7535, or visit them on the web at Sprat Net. After cocktails in the inn’s antiques-filled parlor (the knockout rum punches are legendary), dinner is served on the veranda. Many ingredients are harvested from the inn’s herb garden, fruit trees, piggery, and livestock collection; the scrumptious cured meats, baked goods, preserves, and ice creams are homemade. For more information call 869-469-3477, or visit them on the web at Hermitage Plantation Inn. The Dock is located on the far edge of The Strip, adjacent to the Timothy Beach Resort. A fun place to enjoy Happy Hour Monday through Friday and one of St. Kitts finest local bands on Sunday night! For more information call 1-888-229-2747, or visit them on the web at The Dock Bar. Vibes Beach Bar is the new incarnation of the former Ziggy’s Beach Bar, whose slogan is “Morning, Noon & Night,” and that remains the case. Great beers, great nightlife and great food. 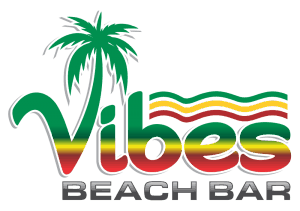 For more information call 869-465-8423, or visit them on the web at Vibes Beach Bar. The party starts early at this jamming shack and goes late. It’s open all day, starting with breakfast, and there’s live music on weekends. For more information call 869-662-3104, or visit them on TripAdvisor at Ziggy’s. 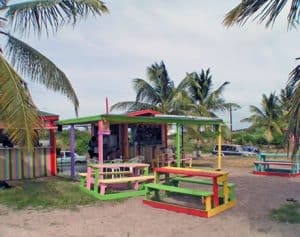 The Rainbow Beach Bar and Grille has a very casual environment where tourists and local residents relax and enjoy great drinks, ribs, and other dishes. It is also located in a region where diners can appreciate beautiful sunsets. They are known for their Friday night DJ dance party. For more information call 869-669-4178, or visit them on TripAdvisor at Rainbow Beach Bar & Grille. 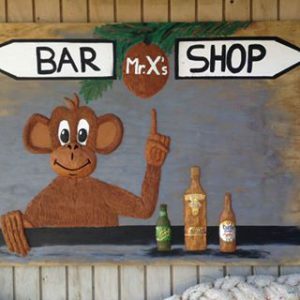 Long considered one of the best beach bars in the Caribbean, Mr X’s Shiggidy Shack is effectively the headquarters of The Strip. It’s worth a visit on any trip to St Kitts and Nevis. For more information call 869-663-4578, or visit them on Facebook at Mr X’s Shiggidy Shack. The beautiful thing about The Strip is the mix of locals and travelers — everybody just seems to get along swimmingly. And that’s nowhere truer than Chinchilla’s, which features terrific Mexican food as well. Get ready to dance. For more information call 869-465-2477, or visit them on Facebook at Chin Chilla’s. Featuring free WiFi, a restaurant and a year-round outdoor pool, Sugar Bay Club offers accommodations in Frigate Bay, just 12 miles from Nevis. Free private parking is available on site. For more information, pricing, or to reserve your room, visit Sugar Bay Club. This luxury resort in the West Indies’ Frigate Bay has spacious rooms that feature a private balcony and scenic views. It includes an on-site golf course, casino and a full-service spa. The St. Kitts Marriott Resort & The Royal Beach Casino offers massages at the full-service Emerald Mist Spa, and Royal St. Kitts Golf Club is on site. There are 3 on-site pools and a whirlpool, and the hotel is on Frigate Bay Beach. Guests at the St. Kitts Marriott Resort can dine at one of the hotel’s 8 restaurants, ranging from Italian cuisine at La Cucina to an American menu at Royal Grille Steakhouse. This resort also features a swim-up pool bar and a beach bar. For more information, pricing, or to reserve your room, visit St Kitts Marriott Resort & The Royal Beach Casino. Featuring an outdoor pool, Royal St. Kitts Hotel is located in Frigate Bay, just 12 miles from Nevis. Free private parking is available on site. Royal St. Kitts Hotel also includes a year-round outdoor pool. Guests can enjoy a meal at the on-site restaurant. You can play ping-pong and pool at the property, and the area is popular for golfing. The nearest airport is Robert L. Bradshaw International Airport, 2.5 miles from Royal St. Kitts Hotel. For more information, pricing, or to reserve your room, visit Royal St Kitts Hotel. 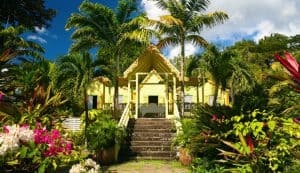 Located in Nevis, 4 miles from Nevis, Oualie Beach Resort features a terrace and views of the sea. Guests can enjoy the on-site bar. Free WiFi is available throughout the property and free private parking is available on site. There is a 24-hour front desk, babysitting services and a gift shop at the property. This resort has water sports facilities and bike rental and car rental are available. There are lots of activities in the area, such as golfing and horseback riding. The nearest airport is Vance W. Amory International Airport, 1.2 miles from Oualie Beach Resort. For more information, pricing, or to reserve your room, visit Oualie Beach Resort. This property is a 4-minute walk from the beach. In a beautiful setting on Nisbet Beach and next to Newcastle Bay, Nisbet Plantation Beach Club features an outdoor swimming pool with Caribbean Sea views. It has spacious rooms, a spa and 3 restaurants. The Great House Restaurant dates back to the late 18th century and serves gourmet cuisine, as well as afternoon tea. Coconuts serves a made-to-order breakfast and there is a weekly seafood barbecue dinner on its terrace. Sea Breeze has lunch and cocktails on the beach. Meals are not included in the room rate. The Palm Spa offers a range of treatments including wraps, massage, facials and manicures. There is also a fitness center, a tennis court and a croquet lawn. Vespa scooters, digital video cameras and hiking GPS devices can be rented at the front desk. For more information, pricing, or to reserve your room, visit Nisbet Plantation Beach Club. Many thanks for the awesome review and if it looks as good as the images portray, it would make a great tourist destination. The beaches and the trails look very attractive and the feature on the Brimstone Hill Fortress interests me greatly as I have a keen interest in history. You have done this destination a great service by highlighting its uniqueness and attractive features. You are very welcome Phil! Thanks for visiting St Kitts and Nevis Travel. Come back again when you are ready to plan your trip! You are welcome Marcus, thanks for reading! I love the Caribbean! This looks like my kind of place. I really like the historical buildings and history in general. I am a big fan of secluded or less crowded places. If I go to a tropical island I want it to feel like the rest of the world doesn’t exist. I really like they way you have described this destination. Your words are so colorful I can imagine being there. It makes me want to be there. Superb job! St. Kitts and Nevis will be on my list of places to go for sure, hopefully in 2018! Hi Jason, thanks for visiting St Kitts and Nevis Travel. Yes, I think that you probably could and would feel like the rest of the world did not exist on St Kitts and Nevis. They are definitely two wonderful Caribbean islands with less tourism than most. Since I live in Europe, I pretty much didn’t know that this island exists. Your post was so full of information that I don’t have to look elsewhere for traveling information. Seems to be a really pleasant traveling location and I sure will consider it for my next year’s traveling plans. What time of the year do you think would be the best to visit St Kitts and Nevis? When I travel I try to avoid the periods when everywhere is packed with tourists. Hi Erik, From June thru August is going to be the best months to travel, as this is their low season and everything is less crowded. If you want to enjoy St Kitts and Nevis without the crowds, plan on this time to vacation here 🙂 Thanks for visiting St Kitts and Nevis Travel. Wow, what a load of helpful information. St. Kitts is on our list of places to visit for sure. I will definitely use this as a source when we are ready to vacation there. We could plan out our entire trip just from your site! I look forward to reading your other posts to see if I have been to any of the places or want to explore! Hi Kyle and I am glad I could provide the information you are looking for. Please let me know when you are ready to start planning, as I would love to help you get the best deals. Thanks for visiting the St Kitts and Nevis Travel guide. You always seem to give beautiful reviews, Leahrae! I appreciate the details you give by sharing the best time to visit, transportation, etc. Too many times, I let the airfare dictates when I travel, as opposed to what time – in terms of the month – would work best for me. All the places you showcase look exquisite, but the Romney Manor really spoke to me. I am an artist by nature, so to be able to watch artisans during the hand-printing process would be a treat. I never even heard of St. Kitts or Nevis before…You’re just the gal to help me see more of this beautiful world, Leahrae! Great review and fantastic site. We are in the midst of planning for our 2018 holiday and the Caribbean is top of our list. We’d looked at the usual places like Barbados and Jamaica, etc, but St Kitts was never on our radar for no apparent reason! However, this has really thrown a curve ball and I love the sound and look of this place. Thanks for sharing. A feel a visit in on the cards. I am glad you enjoyed reading about St Kitts and Nevis Travel. They are really great Caribbean Islands that sometimes get over looked for sure. 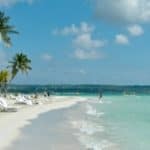 Please let me know if you need any additional information for planning your trip to the Caribbean, where ever you choose. One more questions, I am wondering if it is possible to plan a trip to Barbados, and then catch a direct flight to St Kitts. Would this be feasible, not too expensive or hopefully a quick flight? Your tour guide is fabulous Leahrae, just going through the pages is like being on holiday already. There are places I even never knew existed. I am ashamed to say that for some of them I have to ask Google maps to show me where it is. Our planet is really a paradise (in some places of course). I wonder if you have had the privilege of visiting most of all of them? I am still traveling with you Leahrae and I hope that one day soon my wife and myself will find THE place we want to visit. Oh, I have been to quite a few of the places, but there are also many that I have not. They of course, promptly went on my bucket list. I have friends who have traveled to many of them, and other resources I use. But, yes it does take us to paradise even if we are not actually there with our toes in the sand. I am glad you enjoyed reading St Kitts and Nevis Travel! I love your reviews! The detail makes you desire to visit so badly. I love this island especially because of the temperatures. I live near Vegas and it can get almost 120 degrees F in the summers so these temperatures are nothing to me plus I love warm temperature water. Zip lining looks scary but I would love to try it and boy does that manor look gorgeous. Great post! Thank you Melissa and thanks for visiting St Kitts and Nevis Travel. Yes, I know too well. I lived close to Vegas as well, and hot is just hot. 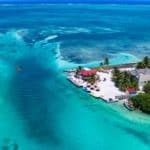 The temperature in these two awesome Caribbean islands is perfect, and you would love zip lining! I couldn’t wait to read this post. I was once a resident of St Kitts. I lived there for two years and it was heaven on earth! It’s so good to see so many familiar bars and restaurants are still operating. Was just looking for information on them, thinking about going back for a visit. Great information, and spot on! Wow ! Now THIS is what I call a comprehensive review of a dream Vacation Spot ! 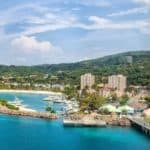 My girlfriend and I have always wanted to visit the Caribbean and it looks like St. Kitts and Nevis is a MUST VISIT after reading your review – I am so glad I found your site and I will make sure to bookmark it for future reference as I see that you have so many vacation spots reviewed here. I was surprised to read on your site that I MUST have a 6 months passport passed my stay to go and also proof of proper funds. Why is that ? Income Tax Invasion ? Thank you Rico 🙂 Yes, you must visit St Kitts and Nevis. More like a dream Caribbean vacation destination for sure. The 6 month rule really stems from the fact that a Visa is not required. Most Caribbean Islands follow this rule, and it is best to renew your passport up to 9 months before traveling to be safe. Thanks for visiting St Kitts and Nevis Travel.